AC/DC made a video with Axl Rose promoting the band's show in Lisbon, Portugal. 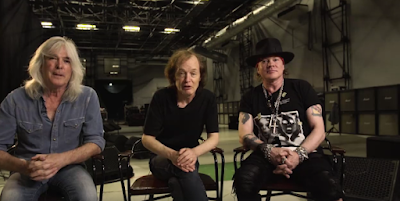 The clip features Axl Rose, Angus Young and bassist Cliff Williams sitting in their rehearsal studio and inviting Portugese fans to the first rescheduled date of their "Rock Or Bust" world tour. You can watch the video below.